A couple years ago, I launched a company. A friend designed an amazing logo, and I made up some business cards. However, I didn’t tell anyone about the company for a long time. Why? I didn’t have a website. The paradox of doing web development is that you will never be satisfied with anything you make yourself. Your standards are too high; your ideas are too time-consuming. You end up putting it off. I put up a variety of “Coming Soon” pages, and eventually made a one page, minimalist site that has lasted for far too long. 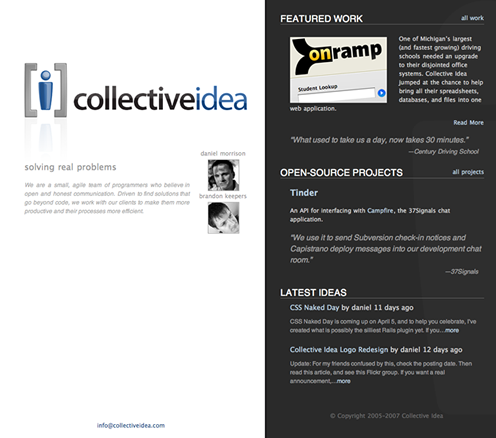 It is with great joy that I announce the new collectiveidea.com. We have a new site, designed by Brian Morykon that keeps its minimalism while also giving us a space to grow. You might notice that we’ve added a blog, but not in the typical way. We’re aggregating relevant posts from our own blogs. We decided that the world didn’t need another blog. Also, we’re using it to promote transparency. Collective Idea is us, we’re real people. We’re not going to hide from that. We’ve also created a Twitter account (collectiveidea) that we’ll be using to post sparse updates. If you’re on Twitter, follow us! We’re going to beef up the feed for the blog a bit, add some photos to the portfolio, and keep playing. For now, we’re going to enjoy having a real site. The site looks terrific! Nice work! Good job! That’s one sharp looking site. Nice stuff guys. Keep it coming. How web 2.0 of you. :) It looks nice, and I love the architecture too! Jason, the official abbreviation for Collective Idea is “[i]”. “Simplicity is the ultimate sophistication.” The site looks great. Categorized in announcement, collectiveidea, and design.